One of the most popular casual games of all time is now arriving for mobile devices. Marble Blitz - Ball Blast Legend revolves around blasting small balls from the center pedestal at orbs that snake around the outside of the screen. Are you ready for a new mania game? Move and rotate your statue and make colour combinations by shooting marbles at the right angle. Explore a huge dungeon map filled with treasures and gems to collect. 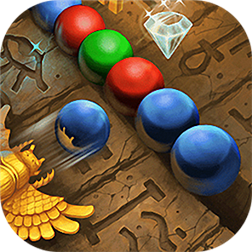 Go on a puzzling adventure, defeat the many quests and come out victorious as you shoot your marbles to make great combos!